BuyBust is a 2018 Philippine action thriller that has been getting rave reviews in North America and we now have a fresh look at Erik Matti's intense trailer for the movie, which debuted at Comic-Con today. In addition to directing the film, Matti also co-wrote the screenplay with Anton Santamaria. Pre-production started back in 2016, which is also when the cast was announced. 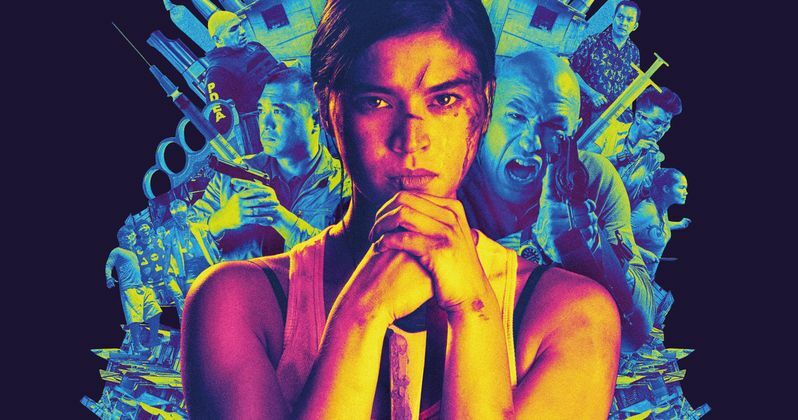 Anne Curtis and MMA fighter Brandon Vera star in BuyBust, which Matti calls his first "full-on action film," and declared that it's the most ambitious project that he's ever been a part of. BuyBust required some major training for the cast. Anne Curtis went through a rigorous program at the Scout Ranger Training School, where she learned how to fight with a knife in close quarters. Additionally, she went through basic weapon handling as well while also running with 26-pounds of weight strapped to her back to fully prepare for the BuyBust role. All of the training paid off as Curtis insisted on performing most of her stunts on her own. In the Philippines, BuyBust received high marks across the board with the Cinema Evaluation Board giving it an "A" grade. North America has also been singing the praises of Erik Matti's first foray into the world of action thrillers. Major publications have been scoring the movie high and praising the "superbly executed" action scenes that Anne Curtis trained so hard for. The Hollywood Reporter says that BuyBust is essential viewing in the Philippines, where it is "bound to raise a ruckus when it opens" and "likely to captivate audiences." Now, that the San Diego Comic-Con trailer has been released, North America is getting ready to check out the film as well. BuyBust has some serious hype around it right now, which seems warranted after checking out the reviews and seeing reactions to the trailer online. BuyBust opens in theaters all over North America on August 10th, which is now only a few weeks away after opening in the Philippines on August 1st. The movie is continuing to receive rave reviews after screenings, so it's hopeful that the film will be able to make some decent money at the box office upon its premiere later next month. You can check out the awesome trailer for yourself below, provided by Eddie Mou's YouTube channel.